While collaborative partnerships between urban planning and public health may seem novel, the fact is, urban planning as a profession emerged out of 19th century public health initiatives, including tenement housing reforms, the construction of urban water supply and sewerage systems, and the design of suburban "greenbelt" towns. To look at current roles and responsibilities of planning and public health practice professionals today, however, it is clear that the respective missions of the two disciplines have diverged in the last century. This divergence implies, incorrectly, that planning and land-use control related actions no longer affect the public health. In fact, they still do, but through different means and with different health consequences than existed at the outset of the profession. Today we recognize that decisions about land use, community design, and transportation planning have a direct effect on the rate of overweight and obesity, incidence of chronic diseases, such as cardiovascular disease, diabetes, and mental illness, and pedestrian injury and fatality. Additionally, environmental conditions such as poor air quality, deteriorated housing conditions, and ground and surface water contamination all are influenced by land-use planning and all have an effect on public health, especially disadvantaged populations, including minorities, children, and the elderly. 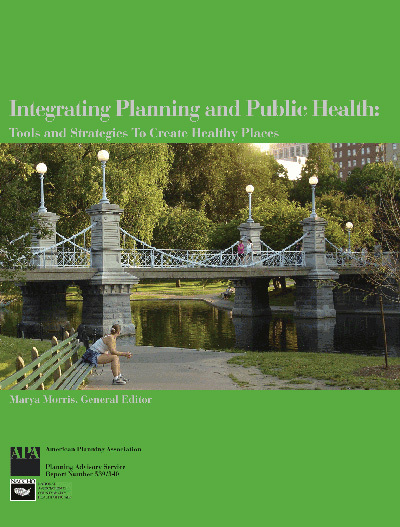 In 2003, a partnership between APA and the National Association of County and City Health Officials (NACCHO) began to restore the bridge between land-use planning, community design, and public health practice. NACCHO is the national nonprofit organization representing local public health agencies (including city, county, metro, district, and tribal agencies). Our organizations are jointly exploring shared objectives, providing tools, and recommending options and strategies for integrating public health considerations into land-use planning. The project aim is to promote an interdisciplinary approach to creating and maintaining healthy communities. The long-term objectives of the project include improving the performance of local planning and public health agencies by providing tools, resources, and networks to foster improved collaboration. An important part of that process is to help local public health agencies (LPHAs) and local planning agencies gain a better understanding of their respective authorities and functions, and how they can provide input and guidance to one another for healthier land-use planning. Through the project we are seeking to raise the awareness of local public health officials so they can proactively participate in land use planning decisions; raise the awareness of local planners so they can bring a more informed health message into the planning process; and facilitate long-term partnerships between these disciplines to design healthier communities. This report examines collaborations between planners and public health professionals committed to building healthy communities. It outlines the five strategic points of intervention at which planners and public health professionals can coordinate their efforts: visioning and goal setting, plans and planning, implementation tools, site design and development, and public facility siting and capital spending. identify communities that have successfully addressed public health issues in the context of visioning/goal setting exercises, long-range comprehensive planning, and current land-use planning (development review) and implementation (e.g., zoning, subdivision control). NACCHO and APA have prepared two fact sheets for planners and public health professionals. The first is a two-part list that defines terms, or jargon, commonly used the respective fields. The fact sheet is intended to bridge the language barrier between the two professions, which is considerable, and can sometimes frustrate and limit a person's willingness to collaborate or expand their view. The fact sheet provides a basis for initial informal discussions between planners and public health officials that would occur before any formal or more institutionalized collaboration would get underway. The second fact sheet, "Working with Elected Officials to Promote Healthy Land Use Planning an Community Design," will help health and planning agencies to broaden their partnerships to include other city and county officials who can work to progress the plan to create healthier communities. APA and NACCHO launched a series of monthly technical assistance calls for public health officials and planners interested in the connection between health and community design. Planners and public health practitioners in the field spoke about strategies, tools, and techniques they have used to integrate health and planning in their communities.